You are here: Home > News > Demolition of the Orpheus-What’s Next? Demolition of the Orpheus-What’s Next? The Ulster Architectural Heritage Society acknowledges with regret the ongoing demolition of the Orpheus building, York Street, Belfast which commenced last weekend, 12th-13th December . The Orpheus was not listed. It is adjacent to, but not located inside the Belfast City Centre and Cathedral Quarter conservation areas. The lack of protection afforded to it left it vulnerable to inappropriate alteration or demolition. Since 2011 the UAHS has called for an alternative plan for the Ulster University development, one that integrated this historic building into its plans. It is unfortunate that despite encouragement, the Ulster University did not see the architectural, cultural and social potential that lies in integration and reuse. This represents another blow to Belfast’s fragile historic environment, and its potential to promote tourism, economic investment and social regeneration. Highlighting further erosion of Belfast’s unique identity, that any other city or jurisdiction would likely preserve. In the case of the Orpheus, public concern not only highlighted the architectural popularity of the building, but also its social significance as a CoOp, ballroom and art school. Historic buildings are not only important architecturally, but represent physical connections to our social and cultural past, important legacies that present generations should be able to continue to use, learn from and enjoy. Each historic building is irreplaceable and opting for demolition over heritage led regeneration signifies an asset lost, and an opportunity missed. Unfortunately this is not an isolated demolition and other, unlisted historic buildings in the area are now under threat as part of the Department of Social Development’s Northside Regeneration plan. 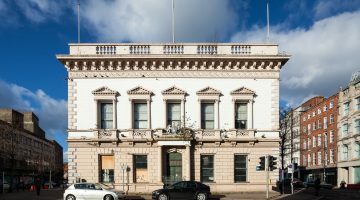 An application currently being considered by Belfast City Council, regeneration plans signal the potential loss of a number of historic buildings including the popular Sunflower Bar, Victorian warehouses, and former commercial premises close to the listed Art Deco former Bank of Ireland, North Street, to name a few. Like the Orpheus, none of these buildings are protected by conservation area or listed status. Despite this, and the relative disrepair of some of these buildings, we recommend that they are of value and should be integrated, harnessing continuity of historic place in the context of new development. We ask those disappointed in the demolition of the Orpheus, and proposals for future demolition of Northside to respond by public objection to Belfast City Council through the planning process [email protected], quoting reference number LA04/2015/0577/O, requesting that historic buildings are appropriately integrated into these plans. We also recommend that Belfast City Council, the Department of the Environment and the Department for Social Development are encouraged to better grasp the social, economic and cultural value of prioritising the protection of historic built environment within urban regeneration projects, planning processes and forthcoming Local Development Plans. Please contact us if you require more information, or advice. You can register your views by writing to: Belfast City Council, Belfast Planning Service, Cecil Ward Building,4-10 Linenhall Street, Belfast. Photo kindly provided by Images NI.